The goals of a facelift procedure include lifting the jowls, tightening loose facial and neck muscles and tightening loose facial and neck skin. For the facelift procedure, it is very important to achieve a natural looking result so that the face looks naturally refreshed and rejuvenated. Excellent candidates for a facelift include both men and women in their 50s and 60s who want to look more refreshed and rejuvenated because their face and neck areas are starting to show the signs of aging. 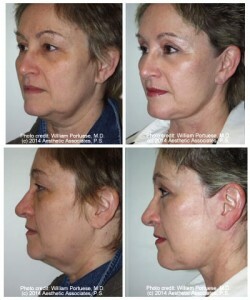 The consultation with a top facelift surgeon like Dr. Portuese in Portland Oregon lasts approximately 30 minutes to review concerns and the procedure to address those concerns, as well as an additional 30 minutes with the patient care coordinator to discuss fees, additional questions and scheduling for the facelift procedure. Dr. Portuese meets again with the patient before surgery to review the anticipated results and to answer any additional questions. Patients will also meet with the board certified physician anesthesiologist before the surgery. The procedure itself takes approximately 3 hours and for patient safety and comfort, will be performed under general anesthesia. Patients wake up in the recovery room for a couple of hours and then are discharged to home with their responsible caretaker. Dr. William Portuese does not use any pressure wraps or bandages; however he does use small drains which are removed within one to two days after the day of surgery. Using drains removes blood from underneath the skin and allows for faster healing and recovery. Sutures will also be removed in the first few days after the procedure. Patients will have post op appointments 2-3 times in the first 10 days after the procedure, and at one month, 3 months and 6 months. For facelift surgery in Portland Oregon, contact a top face lift surgeon at The Portland Center for Facial Plastic Surgery today at (503) 899-0006. Seeing patients from Multnomah County and Washington County Oregon.